I remember being about 10-years-old and walking to primary school along Kentish town high street and seeing this bus plastered with large posters for the production of Five Guys Named Moe. This was before my love of musicals had progressed beyond films such as Grease and anything with Doris Day in it. 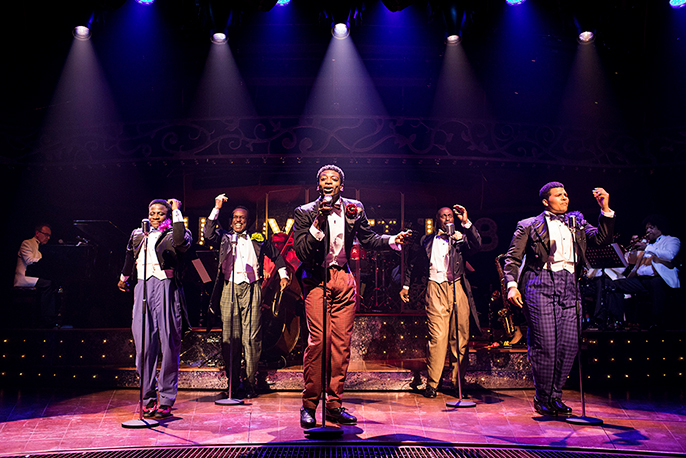 However, perhaps a part of me knew what was to come as I wanted to see this production with these beaming, bright, happy looking black guys in it – not a familiar sight back then…or now come to think about it. Perhaps my attention was also caught as I recognised Paul J Medford who was a popular character in EastEnders as well as one of the few black faces on television. In any case nearly 30 years later the opportunity arose to fulfil that childhood desire and it did not disappoint. Five Guys Named Moe is an energy packed burst of sunshine for the eyes, ears and soul – the colours of the suits alone necessitate sunglasses! What I loved most about Five Guys was that I felt like I was getting a little insight into the minds of men. 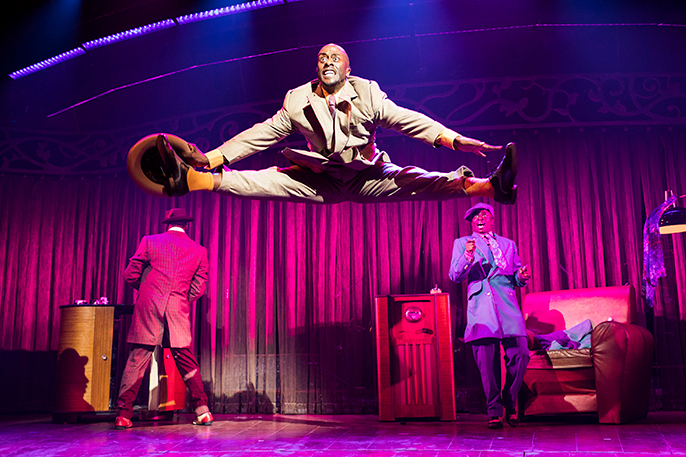 One of the questions I would have loved to ask Clarke Peters the creator and director would have been what inspired you to write this particular play. Thankfully I am not alone and someone did ask him this question and he said ‘Louis Jordan’s music is of course integral to the show…I used those songs to address some of the situations I was dealing with myself at the time.’ This personal element is definitely present under all the fun, music and amazing dancing holding it together and providing a solid foundation that we can all relate to – relationships, ego, bad decisions, self-denial and the painful but necessary realisation that can lead to a happy ending. As we take a journey with Nomax played by Edward Baruwa to address his inner turmoil through the musical messengers sent from his radio in the form of these five guys named Moe Ian Caryle’s Sammy Davis Junioresque Four-Eyed Moe, Idriss Kargbo’s Little Moe, Dex Lee as Know Moe, Horace Oliver’s Big Moe and Emile Ruddock’s Eat Moe. 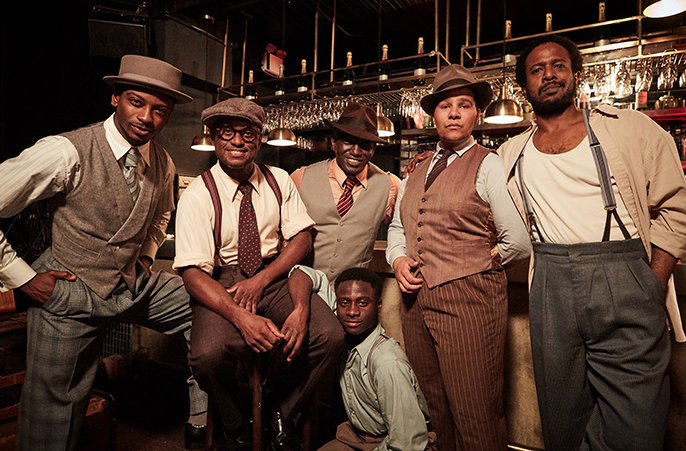 This ensemble of talented, believable and engaging actors really brought this piece alive. The interaction with the audience was unexpected but creates a connection and direct involvement with and from the audience. The interaction with the audience was unexpected but creates a connection and direct involvement with and from the audience. The jury is still out as to whether it is necessary as I did find it distracting at times. However, the audience’s moderate and fun participation does make it a great choice as we slide into the holiday season. Look out for stand out songs like ‘What’s the use of getting sober’ by Nomax and a clear favourite ‘Caldonia’. While these were my favourites the music, the voices and the excellent band will transport you to another time and place where it is easier to smile, easier to relax and so easy to let go of life’s challenges for 2 hours and 10 minutes and just explore the gentle madness of being human and maintaining a healthy relationship with others and with yourself. 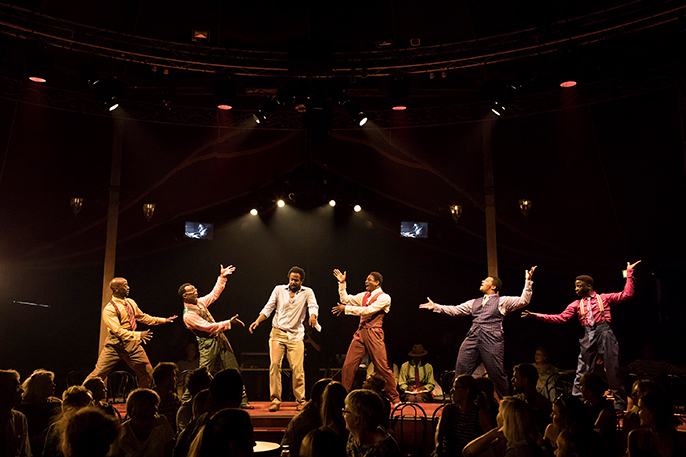 From the Spiegeltent theatre to the production that is Five Guys Named Moe and all that contribute to making it what it is don’t miss out and enjoy something it took me 30 years to get to see and recognise that it was well worth the wait. Five Guys Named Moe is playing at the Marble Arch Theatre don’t wait until the last minute because tickets for this will be going fast!